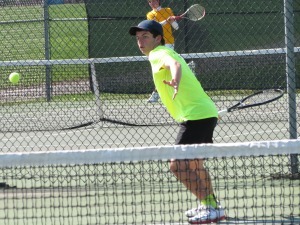 Singles POY: Nick Hebda (ND). Coach of the Year: Paul Garvin (NZ). Team standings: 1. Benet 56, 2. Nazareth 46, 3. Saint Viator 36, 4. Carmel Catholic 35, 5. Notre Dame 29, 6T. Marian Central, Marist 21, 8. Marian Catholic 19, 9. Joliet Catholic 2, 10. St. Patrick 0. First singles: Nick Hebda (ND) beat Michael Rooney (NZ), 6-7, 7-6, 6-1. 2S: Danny Smith (BA) beat Johnny Hamilton (NZ), 6-0, 6-1. 1D: Danny McGuigan-Casey Schrader (BA) beat Michael Dowlings-Ian Brzeski (MCC), 6-2, 6-3. 2D: Luke Gerken-Ben Paoni (BA) beat Matthew McManaman-Andrew Kicinski (SV), 6-3, 6-2. 3D: Ryan Yang-Johnny Bavone (BA) beat Kevin Cahill-Tommy Moody (NZ), 6-3, 6-3. Team standings: 1. Benet 56, 2. Saint Viator 39, 3. Notre Dame 37, 4. Nazareth 36, 5. Marian Central 32, 6. Carmel Catholic 31, 7. Marian Catholic 19, 8. Marist 13, 9. Joliet Catholic and Saint Patrick 1. First singles: Nick Hebda (ND) beat Patrick McGuigan (BA), 6-3, 6-3. 2S: Ian Brzeski (MCC) beat Johnny Hamilton (NZ), 6-0, 6-1. 1D: Danny McGuigan-Casey Schrader (BA) beat Nathan Schedler-Alex Colbert (CA), 6-1, 6-1. 2D: Teddy Evans-Phil Piscopo (BA) beat Emmitt O'Malley-Tommy Blatz (ND). 3D: Jack Mannebach-Luke Gerken (BA) beat Matt McManaman-Andrew Kicinski (SV), 6-3, 6-3. Team standings: 1. Benet 56, 2. Carmel Catholic 50, 3. Saint Viator 33, 4T. Marian Catholic, Notre Dame 28, 6. Joliet Catholic 24, 7. Marian Central 22, 8. Nazareth 16, 9. Marist 6, 10. Saint Patrick 2. First singles: Jack Geissler (JC) beat Jack Carroll (BA), 6-4, 7-5. 2S: Jonathan Paulson (CA) beat Owen McNamara (BA), 6-1, 6-2. 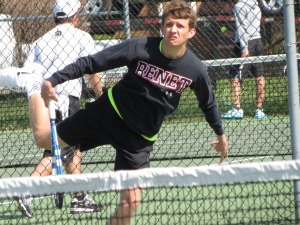 1D: Declan McNamara-Riley Marshall (BA) beat Steven Zemaitis-Matt Colbert (CA), 6-2, 7-6. 2D: Johnny Carlson-Danny King (BA) beat Alex Colbert-T.J. Harrigan (CA), 6-1, 6-3. 3D: Vince Jansen-Riley Ley (CA) beat Philip Piscopo-Teddy Evans (BA), 6-1, 6-3. Team standings: 1. Benet 57, 2. Carmel Catholic 50, 3. Notre Dame 36, 4. Joliet Catholic 35, 5. Saint Viator 24, 6. Marist 19, 7. Marian Catholic 18, 8. Marian Central 16, 9. Nazareth 10, 10. Saint Patrick 0. First singles: Jack Geissler (JC) beat Pete Mannebach (BA), 6-0, 6-0. 2S: Owen McNamara (BA) beat Nick Marselle (ND), 6-0, 6-2. 1D: Michael Butler-Kevin Hunt (CA) beat Patrick McGuigan-Riley Marshall (BA), 7-5, 4-6, 6-3. 2D: Stephen Kovach-Danny King (BA) beat Colin Verwijst-Matt Colbert (CA), 6-3, 6-2. 3D: Declan McNamara-Philip Piscopo (BA) beat Jonathan Paulson-Alex Colbert (CA), 6-3, 6-4. Team standings (season + tournament): 1. Benet 55, 2. Carmel Catholic 42.5, 3. Marian Catholic 41, 4. Joliet Catholic 39.5, 5. Saint Viator 20, 6. Notre Dame 15, 7. Marist 14, 8. Nazareth 13.5, 9. Saint Patrick 2. 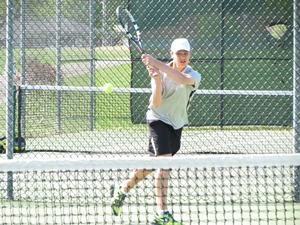 First singles: Kyle Scheffers (MC) beat Noah Read (BA), 6-1, 6-1. 2S: Pete Mannebach (BA) beat Patrick Murday (MC), 6-4, 6-4. 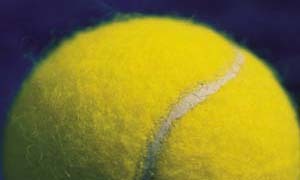 1D: Riley Marshall-Patrick McGuigan (BA) beat Michael Hendricks-Michael Butler (CA), 6-2, 6-4. 2D: Kevin Burns-Stephen Kovach (BA) beat Ryan Hippman-Dyllan Mattea (JC), 6-1, 6-1. 3D: Jack Armonda-Kyle Hand (BA) beat Freddie Harvey-Seth Stockl (JC), 6-3, 2-6, 7-5. Team standings (season + tournament): 1. Carmel Catholic 74, 2. Benet 67, 3. Marian Catholic 55, 4. Nazareth 45, 5. Joliet Catholic 43, 6. Saint Viator 22, 7. Notre Dame 20, 8. Marist 15, 9. Saint Patrick 5. 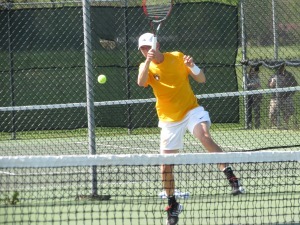 First singles: Kyle Scheffers (MC) beat Kevin Hunt (CA), 6-1, 6-4. 2S: Brandon Dechter (CA) beat Alex Romano (BA), 6-1, 6-0. 1D: Grant Gatto-Noah Read (BA) beat Stephen Feely-Bryan Hunt (CA), 6-4, 7-6. 2D: Matt Garvin-Stephen Kovach (BA) beat Michael Butler-Craig Paulson (CA), 6-2, 3-6, 6-1. 3D: Mick Wimmer-Alex Reid (CA) beat Kevin Burns-Conor Flynn (BA), 6-4, 6-2. Team standings (season + tournament): 1. Benet 69, 2. Carmel Catholic 68, 3. Marian Catholic 66, 4. Saint Viator 35, 5. Joliet Catholic 34, 6. Marist 30, 7. Nazareth 25, 8. Notre Dame 8, 9. Saint Patrick 6. First singles: Julian Childers (MC) beat Matt Bisbee (MA), 6-1, 6-0. 2S: Kevin Hunt (CA) beat Andrew Caniglia (BA), 6-2, 6-0. 1D: Bryan Hunt-Geoff Butler (CA) beat Bobby Martin-Matt Rurka (BA), 6-3, 7-6 (9-7). 2D: Grant Gatto-Matt Garvin (BA) beat R.J. Paulson-Stephen Feely (CA), 3-6, 6-2, 6-2. 3D: Alex Romano-Kevin Dawson (BA) beat Nico Moorman-Patrick Murday (MC), 6-4, 4-6, 6-0. Team standings (season + tournament): 1. Marian Catholic 51.5, 2. Benet 51, 3. Marist 40.5, 4. Nazareth 24.5, 5. St. Viator 22, 6. Carmel 19.5, 7. St. Patrick 14, 8. Joliet Catholic 11, 9. Notre Dame 8.5. First singles: Julian Childers (MC) beat Alex Haizel (Mst), default. 2S: Josh Pinkus (MC) beat Chris Siemann (B), 6-4, 4-6, 6-2. 1D: Mitch Zavesky-Kyle Scheffers (MC) beat Phil Denys-Matt Rurka (B), 6-0, 7-6 (13-11). 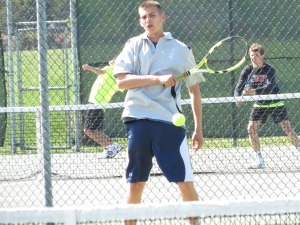 2D: Mike Schutt-Bobby Martin (B) beat Nate Bodnar-Nico Moorman (MC), 6-2, 6-3. 3D: Grant Gatto-Noah Read (B) beat Jack King-Adam Fabry (Mst), 6-1, 6-0. Team standings: 1. Benet, Carmel Catholic 46, 3. Marian Catholic 43.5, 4. Marist 26, 5. Saint Viator 24.5, 6. Notre Dame 19.5, 7. Joliet Catholic 17, 8. Nazareth 13, 9. Saint Patrick 2. First singles: Julian Childers (MC) beat Alex Haizel (Mst), 6-1, 6-3. 2S: Mitch Zavesky (MC) beat Matt Bisbee (Mst), 6-4, 6-7, 6-4. 1D: Taylor Blaney-Dean Tanglis (SV) beat Chris Butler-Geoff Butler (JC), 7-5, 6-2. 2D: Andrew Caniglia-Andrew Herrmann (B) beat Billy White-Greg Hyde (CA), 6-1, 6-3. 3D: Bobby Martin-Mike Schutt (B) beat Ryan Healy-Eric Fall (CA), 6-1, 6-2. Team standings: 1. 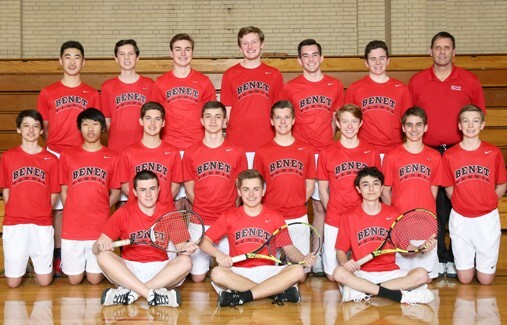 Benet 64, 2. Marian Catholic 61, 3. Carmel Catholic 60, 4. Marist 47, 5. Notre Dame 45, 6. St. Viator 41, 7. Nazareth 39, 8. Joliet Catholic 24, 9. St. Patrick 6, 10. St. Joseph 3. 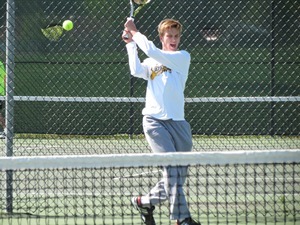 First singles: Julian Childers (MC) beat Ryan Mullaney (Naz), 4-6, 6-4, 6-3. 2S: Matt Bisbee (Mst) beat Ronnie Wing (ND), 6-4, 7-5. 1D: Chris Butler-Dan Avampato (CA) beat Mark Angel-J.J. Donohue (BA), 6-7, 6-2, 7-5. 2D: Collin Main-Tim Whelan (BA) beat Billy White-Connor McNally (CA), 5-7, 6-1, 6-1. 3D: Andrew Herrmann-Matthew Nelligan (BA) beat Dan Reiss-Greg Hyde (CA), 6-2, 6-1.